Ever play Sim City? I must admit, I haven’t done it in like 15 years, but I always loved to watch what happened when you built a neighborhood by an industrial zone, or watch a neighborhood grow when you added a commercial district beside it. Sim City is a lot like real life in the way something outside a neighborhood can have an impact on what happens within a neighborhood. One day several years ago, I was talking to a neighbor who bought her house brand new back in the early 70’s. We were talking about all the traffic on Pimlico Parkway. She told me that before they opened Man-O War, the only traffic on Pimlico Parkway was just people from the neighborhood. It was just the main drag through the neighborhood, like any other entrance and exit in your neighborhood…..until something changed. And I guess that is what is on my mind. How things are always the same, until something changes. Another example of a road like this is Autumn Ridge Blvd. I remember when it was a new neighborhood. You took Autumn Ridge all the way back, turned on Pleasant Ridge just like you do today, only back then it ended before you got to Andover Forest…..and oh, there was also no Hamburg back then either. Next thing you know, Hamburg is built and you can get to it straight through Autumn Ridge. It really worked out great for everybody….except those folks that lived on the cut through streets. They saw a lot of traffic and watched as their houses became less valuable than the same house on a different street in the neighborhood. So, here is my advice: Don’t buy a house on a road that ends at an undeveloped area. 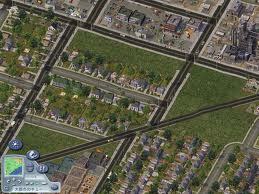 SOMETHING will eventually be there….just like on Sim City, and odds are it will change the vibe of your neighborhood. Sometimes it changes it in a good way, but most of the time it means increased traffic, which usually means increased crime…..just like Sim City. Here is some more advice: When you are considering a neighborhood that has roads like that, take a look at a satellite view of the neighborhood. You want to see what is on the other side of the vacant land to see what may eventually be connected to your neighborhood. Also, don’t rely on zoning. I hear people say things like, “Oh, that is zoned for single family, so we’ll be okay.” Well, lets say that it stays zoned as such. That doesn’t mean that it will be a single family neighborhood similar to your neighborhood? But even more of a big deal is that there are zoning changes all the time. And you know what usually happens when there is a big change in the neighborhood don’t you? All your neighbors decide to move at the same time. Never a good thing for resale value……and Game Over for you!